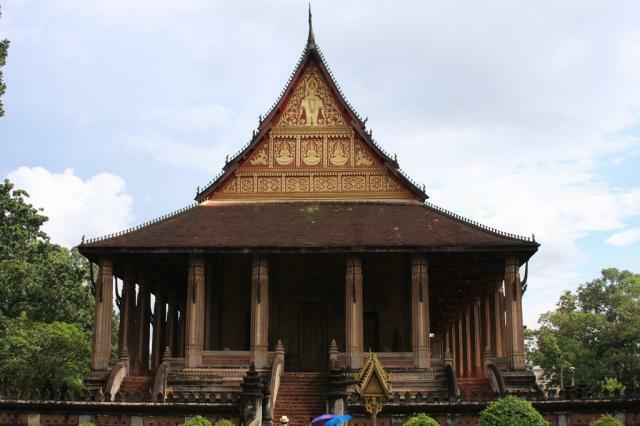 Due to its isolation and basic infrastructure, Laos has maintained itself as a backwater destination of south east Asia, not attracting even a quarter of the tourists that visit Thailand and Japan. However, from this separation and lack of economy, it manages to preserve the traditional way of life. For travelers, if you want to step off the beaten path, this is the best trail to start on. The Plain of Jars, designated a UNESCO sight, is a perfect example of the mystical, old world sensibility that is one of the main attractions of Laos. Thought to be part of an ancient caravan route, the jars are massive rock objects sometimes ten feet tall. Unfortunately, thousands of unexploded bombs strewn throughout the plains that make up the jar sites limit visitors to only a few of the areas with jars. The rest are all considered too dangerous. That Luang (the Royal Stupa) is perhaps the one un-missable sight in Laos. A religious monument, reportedly Laos' most important religious building, the temple's golden spires reach up into the sky and are visible for miles. The majority of tourists to Laos stick to the north. The infrastructure is better in this half of the country, but if you're looking for real adventure and parts of Laos your friends will not have seen, head south. Follow the river by bus and boat. Catch the local water taxi boats between shore villages and stay in guest houses where you're likely to be the only western faces. As of 2016 the southern border between Laos and Cambodia is open, but that is subject to change. A bus will drop you off just shy of the border, you walk across and board a different bus on the other side. Pack your patience and your sense of humor. Laos is sandwiched between Vietnam and Thailand, and it would be wasting a great opportunity not to see those countries while you're in the area. If you want to start your trip in Laos, there are flights into the country, although they will be more expensive than flights into Thailand. Laos has a decent hospitality infrastructure and enough beds to accommodate all of its tourists. Hotels are available in several of the bigger cities, hostels are even more common and more affordable. If you are visiting the, less traveled, southern half of Laos, from Pakse towards the Cambodian border, be sure to make a stop in the 4000 islands. Don Khong Island is a perfect place to spend a few days and to see some ruins that were built before Angkor Wat, the famous set you're likely to see in neighboring Cambodia.